After eight years of Cornucopia’s research, advocacy, and petitioning, the National Organic Standards Board (NOSB) voted in November 2016 to remove carrageenan, a potent inflammatory agent and possible carcinogen, from the National List for use in organics. 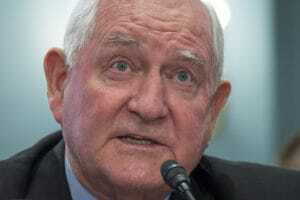 Instead of listening to the expert policy advisory panel set up by Congress, USDA Secretary Sonny Perdue listened to powerful agribusiness lobbyists and overruled the NOSB. We are investigating legal options, but as of right now, it remains legal for organic food companies to use carrageenan — although most have voluntarily removed the ingredient linked to intestinal inflammation and cancer. This was a huge win at the NOSB! A special thank you is due to the 47,000 Cornucopia members and supporters who signed the petition and shared their personal stories with the board about how carrageenan has made them ill. We respect your voices but obviously the current administration does not (and we can’t say the situation was much better during the Obama/Vilsack years at the USDA). For the time being, please consult The Cornucopia Institute’s web-based carrageenan buying guide to protect your family. You can buy excellent organic food without carrageenan in every product category. Research links carrageenan to gastrointestinal inflammation, including higher rates of colon cancer, in laboratory animals. Yet it is still found in many foods, including some certified organic foods. 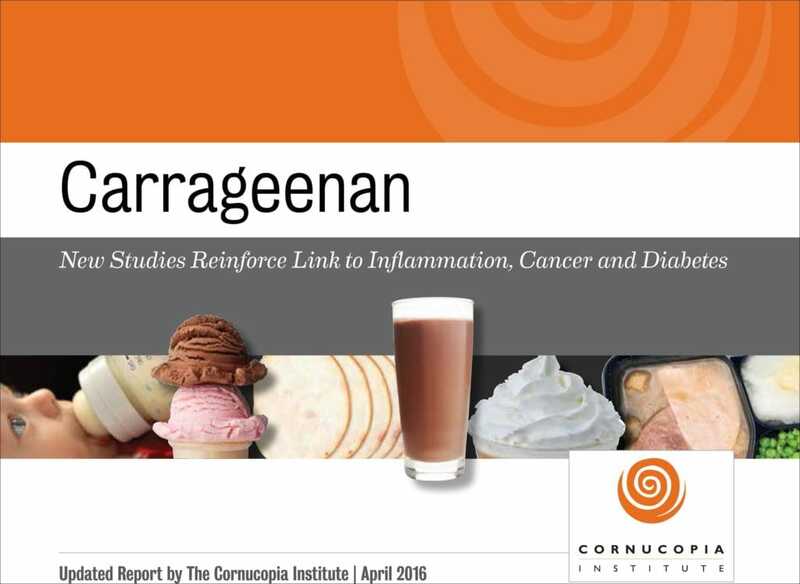 Cornucopia’s report, Carrageenan: New Studies Reinforce Link to Inflammation, Cancer and Diabetes, compiles scientific studies pointing to harm from consuming food-grade carrageenan. Read The Cornucopia Institute’s updated full report on the dangers of carrageenan. Read the news release about the report. Protect yourself and your family with Cornucopia’s carrageenan buying guide. Many people report significant improvements in their gastrointestinal health after cutting carrageenan out of their diet. If your health improved after eliminating carrageenan from your diet, please let us know about it by filling out this questionnaire developed in collaboration with medical researchers. Sign Cornucopia’s petition to the FDA to remove carrageenan from the food supply. The USDA’s National Organic Standards Board (NOSB) first approved carrageenan in the mid-1990s based on misinformation supplied by corporate “independent” scientists and successful lobbying by manufacturers and food processors. In April 2016, the NOSB conducted an initial review on whether or not carrageenan should continue to be used in organic food. After assessing written and oral public comments at the spring meeting, the NOSB voted in November 2016 to remove carrageenan from the National List of substances allowed in organic food. Cornucopia, along with several farmer and consumer groups testified at the April 2016 NOSB meeting that carrageenan does not meet the criteria defined in the Organic Foods Production Act, including essentiality and harm to human health. Dr. Joanne Tobacman, a physician, scientist at the University of Illinois College of Medicine and the nation’s foremost independent expert on carrageenan, presented her research and urged the NOSB to remove carrageenan from organic foods as well. The carrageenan trade lobby group, United 4 Food Science, fought back hard, and found allies in companies that make organic products containing carrageenan such as organic liquid infant formula (Similac) and vegan products (Follow Your Heart). Many companies that had fought to continue using carrageenan, including Group Danone (Stonyfield), CROPP (Organic Valley), WhiteWave (Horizon and Silk), Hain Celestial (Earth’s Best, Rice Dream and Westsoy) and Smucker’s (Santa Cruz Organics and R.W. Knudsen), have since removed it from some or all of their products in response to consumer demand. In past reviews, including the Sunset Review by the NOSB in 2012, lobbyists convinced enough corporate-friendly NOSB members, including employees of Whole Foods, Organic Valley and Driscoll’s, to ignore the disturbing findings of dozens of independently funded and peer-reviewed studies, including several that found higher rates of colon cancer in lab animals given a diet containing food-grade carrageenan. For decades, most organic food companies considered the seaweed-based “natural” food additive to be safe. The carrageenan industry lobby group had been effective in suppressing research. 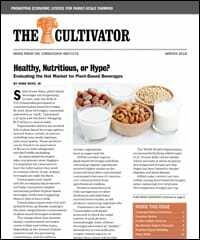 But since May 2012, no one in the organic industry can claim that they are not aware of disturbing research tying the food additive to serious potential health problems. Some companies, like Tofu Shop Specialty Foods and Straus Family Creamery, have always offered foods without carrageenan. Since our initial report was published in 2013, several companies, including Julie’s Ice Cream and Annie’s, have removed carrageenan from their product lines. So Delicious, Eden Foods, Clover Stornetta, Stonyfield Farm, Orgain and WhiteWave have committed to removing it from their products, and have reformulated many already. Cornucopia urges anyone suffering from gastrointestinal symptoms such as irritable bowel syndrome/IBS, spastic colon, inflammatory bowel disease, and chronic diarrhea to eliminate carrageenan from your diet to determine whether carrageenan contributes to the symptoms. If you have eliminated carrageenan from your diet and have found relief from gastrointestinal symptoms, please share your story by filling out a questionnaire developed in collaboration with medical researchers. Your participation will help scientists better understand the severity and degree of carrageenan-related gastrointestinal disease in the general population. On March 15, 2013, The Cornucopia Institute sent a letter to Dr. Margaret Hamburg, then FDA Commissioner, requesting that the agency reconsider their June 2012 decision to deny the citizen petition by Dr. Joanne Tobacman, which requested the removal of carrageenan from the FDA’s list of approved food additives. Cornucopia testified and offered written comments to the National Organic Standards Board (NOSB) on removing carrageenan from the National List at the spring and fall 2016 NOSB meetings. Watch for further updates on steps you can take to help ensure carrageenan is removed from organic food.